Seller is Relocating! Motivated Seller! !, Recent Price Reduction! Live life in your River Front custom Florida home. Built to Last on an Estate lot with Magnificent views of the river from almost every room. No HOA No CDD! Relax on your balcony from your Master suite overlooking Olde Florida. Entertain your friends and family in this gorgeous upgraded kitchen. 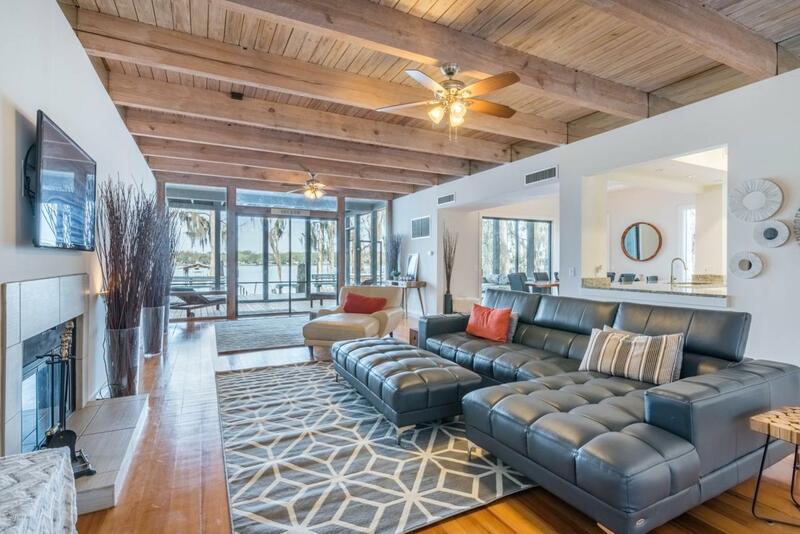 This custom built home features South American hardwood floors, Cathedral Ceilings with Exposed beams, spacious Guest house/office with Loft, Dock with Boat house and Lift. Home sits on 75 solid pilings.The outside is made of durable Cedar, with Cedar making up most of the walls inside as well. A structural engineering report is available as well as a survey of the wetlands and uplands. This custom home offers Complete privacy with a Northern exposure. Also included: stockpile of treated wood for deck and driveway, excellent fishing with access to Doctors Inlet and the St. Johns River, Tool Shed, Cast nets and holding pen. No HOA, and No CDD Fees! Listing courtesy of Solano Real Estate Llc.